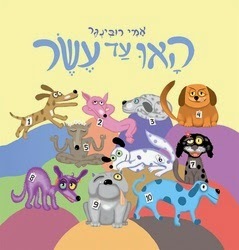 Synopsis: In this counting book from Israeli author and illustrator Mr. Rubinger, we are introduced to ten very different (and quite silly) dogs. We also meet again the funny felines from "Big Cat, Small Cat." Bilingual benefit: This book is also available in Hebrew. Both the English and Hebrew versions teach counting and number recognition. Like all of Mr. Rubinger’s children’s picture books in English and Hebrew, this particular book rhymes well and requires the reader to complete the rhymes. Our toddler is able to complete the rhymes easily in English. Availability in Israel: The English and Hebrew versions are both available in the major chains in Israel, Steimatzky and Tzomet Sfarim. In addition, the English version can be purchased online on Amazon USA. Mama: Highly recommended. I would buy this again and for a friend. See all my reviews on books available in Israel, including a review of Mr. Rubinger's “Big Cat, Small Cat” and "I Dream of an Elephant," both available in English and Hebrew.